Sneak Peek of Disney’s new animated movie “Planes”. 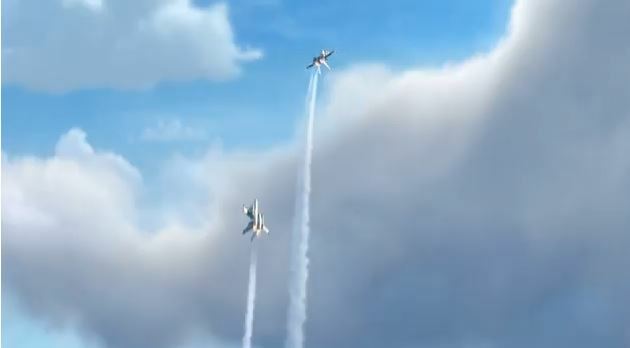 Chemtrails are featured throughout the film, teaching children that it is normal for jets to create lingering trails. The money and effort behind this conditioning of the public is mind boggling. Who says that they will “never” know? so you have given in already!what do you mean your children will never see a natural sky?they never will with that attitude,who’s side are you on? Boy, I have military jets doing exercises over my house out here in the remote desert of SE AZ all the time, and they NEVER leave trails of any kind. BUT, the unmarked white planes that don’t show up on Flightradar24, DO!